Part two I hear you say, but where is part one? Well technically part one happened on Sunday but seeing as I haven't actually written that entry yet (it's coming I promise) this seemed as good a place to start as any. I have just got back from a very enjoyable ramble over the heath and farmland between Pontarddulais and Pontlliw, and for the first time in months there was still light in the sky past seven pm. I can't stress enough how refreshing and relaxing a walk after a day at work can be, and it will be great to be able to photograph some sunsets once again. Tonights was a bit of a washout as you can see above but there was plenty of bird life around to make up for it. Whilst climbing Gopa Hill I heard the first returning Chiffchaff to the valley utter a few snippets of song, while on Bryn-bach-Common the distinctive shout of "a little bit of bread and no cheeeeeese" alerted me to the presence of a Yellowhammer. Initially I couldn't locate it but after a bit of searching I found it sitting atop one of the many Rhododendron bushes that have colonised the valley sides. A few minutes later and another male bird showed itself, just as I disturbed a few Meadow Pipits from the undergrowth. Despite it posing beautifully there just wasn't enough light to attempt a photo. Something to try for this weekend possibly as I am on call from work and can't stray too far from the house. Further down towards Pontlliw it was great to hear the Song Thrushes imitating the calls of some of our seabirds including the Oystercatcher. I imagine this is a trait limited to those individuals that spend much of their time along the coast, but has anyone ever heard a Thrush further inland using similar calls before? Despite their volume they were briefly drowned out as two Crows came in low overhead mobbing a Buzzard. The Buzzard quickly headed for the trees from where it called out in a rather pitiful manner, no doubt trying to reclaim some dignity. I also saw my first couple of Bats of the year (Pipistrelle I presume?) hunting insects along a wooded section of lane. I told them to spread the word that I had a lovely new bat box in my back garden if any of their friends wanted accommodation. It was at this point I realised that my hunger had probably started to affect my mind so I hurried home for some food. I really must remember to take a snack with me next time! Definite sights and sounds of Spring and a nice way to end the day Adam. Can't say that I have heard A Song Thrush doing any imitations but the local Starlings have a wide repertoire! Lovely composition on that picture Adam. I can't say I've heard a Song Thrush mimic an Oystercatcher before, but last year I saw, heard and shot some video of a Reed Warbler, doing a fair impression of a Cetti's Warbler. Frank - Our Starlings do a particularly good line in car alarms on occasion! Keith - Thanks very much. 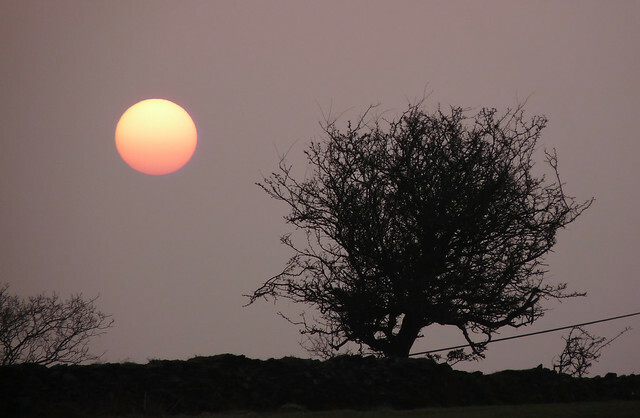 Was glad that I took the photo as the sun disappeared into the murk a few minutes later. And I know what you mean about the mimics. I think the birds are conspiring against us.